Intel Capital, the strategic investment arm of the world's largest chipmaker, announced on Wednesday a $300 million UltraBook fund to invest in new technologies for its new category of tablet-like notebooks that will challenge Apple's MacBook Air. The fund will invest in companies "building hardware and software technologies focused on enhancing how people interact with Ultrabooks, achieving all-day usage through longer battery life, enabling innovative physical designs and improved storage capacity," Intel said in a statement announcing the investment. The company plans to distribute the fund over the next three to four years in hopes of creating a "cycle of innovation and system capabilities" for the new notebook specification. In 2003, the combination of Intels Centrino technology with built-in WiFi, paired with Intel Capitals $300 million in venture investments and other industry enabling efforts, ushered in the shift from desktop PCs to anytime, anywhere mobile computing. Our announcement today is about Intel mobilizing significant investments to achieve the next historic shift in computing, said Intel Vice President Mooly Eden. Since 1991, Intel Capital has invested more than $10 billion in over 1,140 companies in 50 countries. Last year, the organization invested $327 million. Intel's strategy for Ultrabook devices involves three phases: systems based on Intel's 2nd Generation Core processors arriving in time for the 2011 holiday shopping season; "Ivy Bridge"-based Ultrabooks in the first half of 2012; and finally Ultrabooks featuring Intel's 2013 processors, codenamed "Haswell." The chipmaker unveiled the Ultrabook design in May at the Computex trade show, with an aggressive goal of pushing the specification to a 40 percent share of the consumer laptop market by the end of 2012. The Ultrabook specification aims to bring laptops under the $1000 range while remaining less than 21mm thick. The devices are also expected to incorporate "tablet-like" features without compromising on performance. However, Intel's partners have reportedly struggled to keep their forthcoming Ultrabook offerings under the $1000 price tag. For instance, Asustek's 13.3-inch UX31 will sell for $1600, $300 more than Apple's 13.3-inch MacBook Air. Vendors have struggled to find alternatives to the limited-supply magnesium-aluminum chassis that Apple uses for its ultra-thin laptops. 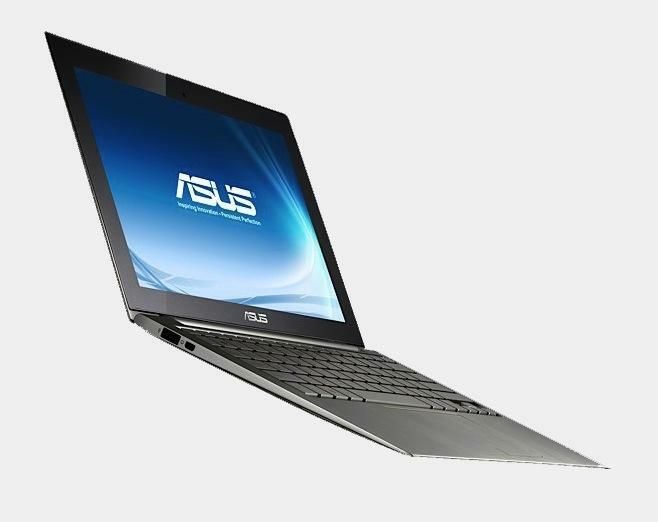 Several PC makers are said to be considering a fiberglass chassis for their first Ultrabook offerings. Late last week, reports emerged that Intel had released to its partners reference bills of materials ranging from $475 to $710. The Ultrabook concept follows Apple's lead in applying lessons learned from tablets to portable computers. Apple CEO Steve Jobs said last year that the design team for the MacBook Air asked themselves "What would happen if a MacBook and an iPad hooked up?" They answered the question by adding instant-on capabilities, extended battery life and solid state storage to the late 2010 MacBook Air, while dropping the entry-level model's price to $999. The refreshed laptop became an instant success. Apple outdid itself in July with another refresh of the MacBook Air, doubling the laptop's performance by switching to Intel's new Sandy Bridge processors, while also adding the new Thunderbolt I/O and backlit keyboards. Like their predecessors, the new MacBook Airs have quickly become best-selling products for Apple, with some models experiencing temporary stock-outs at certain locations.